Article first published as Pesto Chicken Florentine on Blogcritics. Aside from flavor, colors and textures play a big part in the dishes I make. I love colorful dishes that are enticing because we all eat with our eyes first, right? And when it comes to textures, I like dishes that incorporate a combination of creamy, crunchy, soft, hard, thick, thin, etc. But all this lies at the hand of whatever ingredients I have to work with. This Pesto Chicken Florentine successfully achieves the culinary trifecta of flavor, color and texture. The pesto alfredo sauce that coats the dish is full of flavor, yet is balanced enough to not overpower the dish. The colors of red and green pop against the golden hue of the pasta. Lastly, the creamy sauce, juicy tomatoes, and al dente pasta is a myriad of textures that work in harmony. Pasta dishes like this is quick to make, making it a perfect meal for weeknights yet elegant enough to serve to guests on weekend dinner parties. It couldn't be easier to put together either. 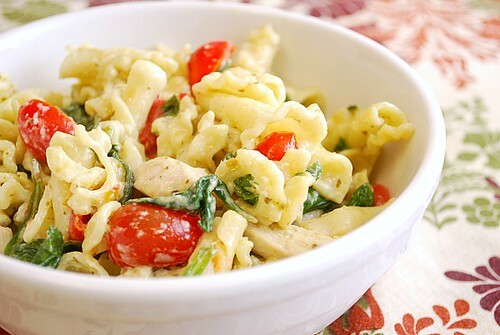 Chicken is seasoned and sautéed with fresh baby spinach and split grape tomatoes before tossing with al dente pasta. To bind it all together and give it a nice punch of flavor, a mixture of alfredo and pesto sauces is used. You can use either homemade or store bought alfredo sauce and/or pesto sauce.... although homemade is always better if possible. I've found this dish tastes even better the next day as leftovers since flavors had a chance to really develop. So given that, you can certainly make this a day ahead! In a large pot of salted boiling water, cook pasta for 8 to 10 minutes or until al dente. Drain and transfer pasta back to the pot and set aside. Meanwhile, heat oil in a large skillet over medium high heat. Add garlic, saute for 1 minute; then add chicken, season to taste and cook for 7 to 8 minutes on each side. When chicken is close to being cooked through (no longer pink inside), add spinach and grape tomatoes and saute all together for 3 to 4 minutes. Add chicken/spinach/tomato mixture to pasta, then stir in pesto and Alfredo sauce. Mix well, top with cheese and serve. I would love to have some of this pasta! You have really hit the mark on the amount of alfredo. The blend of spinach and grape tomatoes are eye catching-no doubt this is delicious. Thanks for sharing. This looks amazing! Do you know if it would freeze well? Looking for new freezer meal ideas for when the next baby comes! Love it when a dish has multiple textures and colors, very pretty dish! Rachel - it does freeze well! In fact, if you do, I suggest you under cook the pasta just a bit so its less than al dente. That way, when you reheat it, the pasta won't overcook and become too mushy. Enjoy! It's beautiful. I love spinach in a pasta (does make the colors pop). This recipe looks so good and would go great with my favorite brand of pasta, Al Dente. They have a ton of variety in flavors and all of their pasta becomes "al dente" in only 3 mins! Check out their recipes and products at http://aldentepasta.com I promise they won't let you down! This looks delicious.....I will give it a try tomorrow.